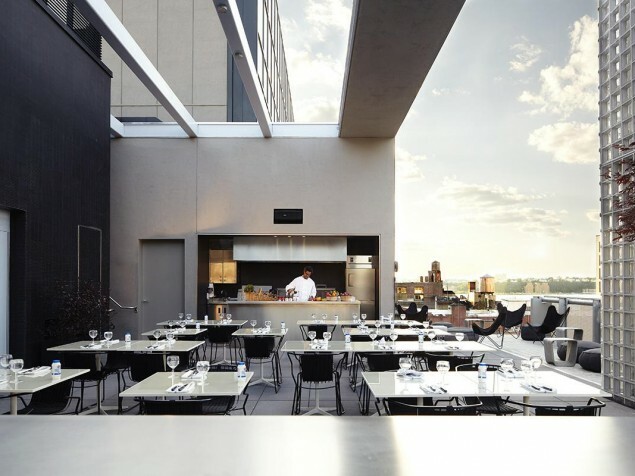 Manhattan is full of narrow building sites, but the eye-catching uber-modern boutique hotel on this site in Chelsea is worthy of your attention and a night's stay. There is truly no place on earth like New York City. It is a city with one of the world’s most diverse populations. As such, it is a unique place where freedom of expression is encouraged, even celebrated. As this great city continues to redefine itself as a progressive world cultural center, we are always looking for something new in hotel design. The Hotel Americano is just that. 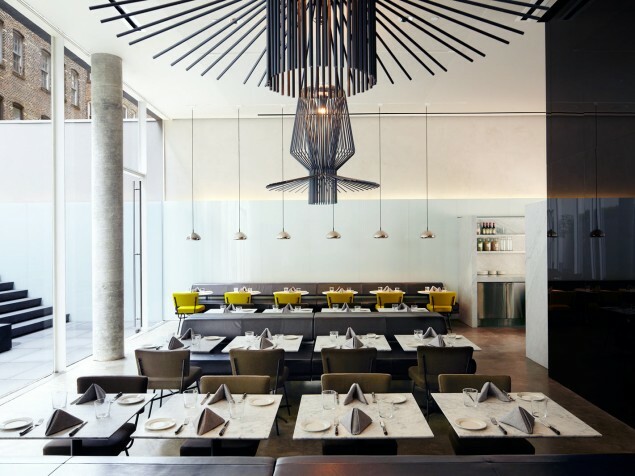 Tucked in between two low-rise buildings in Manhattan’s hip Chelsea neighborhood, the Hotel Americano is the North American debut for the Mexican brand Grupo Habita. The slender, smooth-faced building is the work of local architect Enrique Norten of Ten Arqitectos. Norten is credited as the first recipient of the Mies Van Der Rohe Award for Latin American Architecture in 1998. 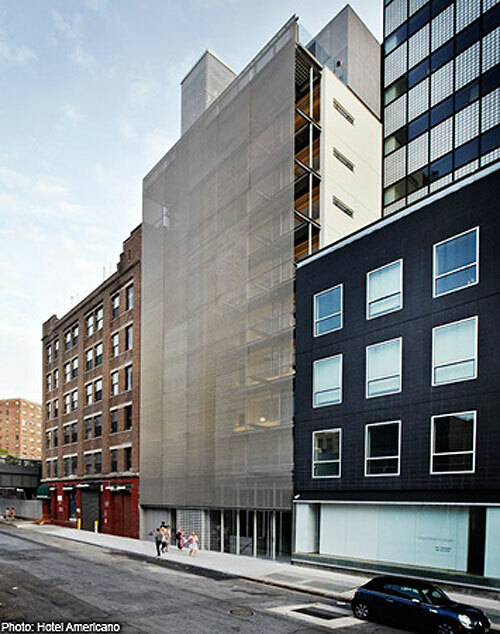 The transparent “skin” of the building is comprised of a stainless steel mesh screen that allows daylight in and views out while controlling glare and heat. The building is small and thus interior space is at a premium. On each floor a most unique design concept emerges. 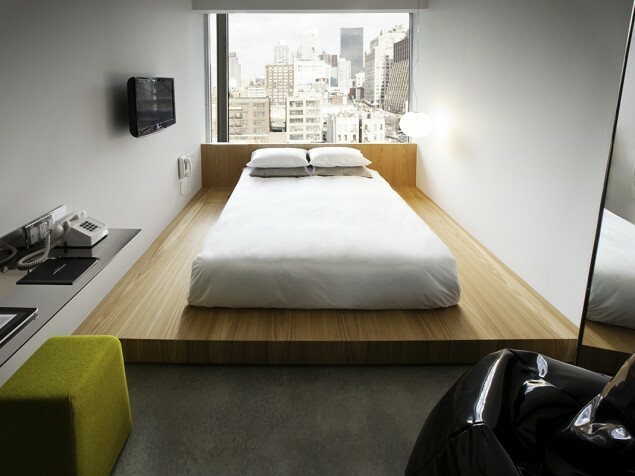 Guest rooms are modern and minimalist, resembling sleek private flats for the urban crowd. Sleeping areas are visually defined by being raised on a platform or arranged to fit within an open cubicle made of natural wood. Bathroom walls are of clear glass maximizing the openness of the room. Norten teamed up with interior designer Arnaud Montigny of MCH, for whom this project is its first in the U.S. Furnishings are distinctly modern with shapes and colors that complement the straight lines and forms of the interior architecture. A blend of French-Latin cuisine from the creative menus of Chef Joseph Buenconsejo is offered in the Restaurant La Piscine. There is an outdoor dining area adjacent to La Piscine and a full service grille on the building rooftop. Hotel Americano offers a Sunday Jazz Brunch. A private lounge at the cellar level can be booked for receptions, private dining and small groups. While the exterior metal face of the hotel draws your attention from the street, what awaits you inside is the real experience. 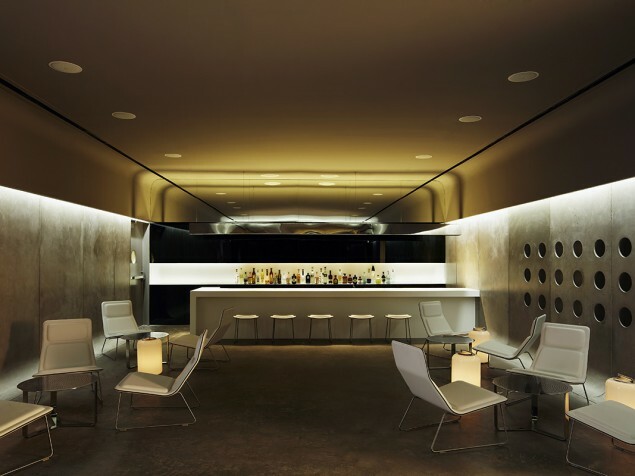 The interiors of the Hotel Americano are immensely creative, welcoming and super cool. Every possible square foot of space in this tiny but mighty boutique hotel has been maximized for usability and effect. It is an unusual and exciting new hotel option in the always progressive Manhattan destination.